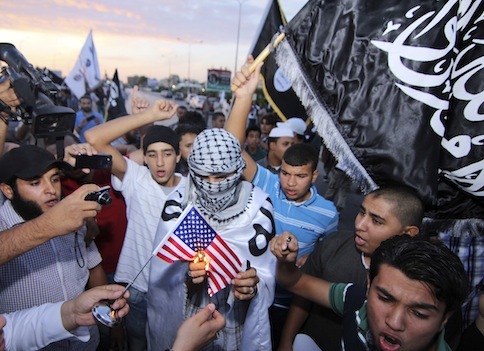 The Obama administration failed to act against Libyan Islamists who attacked the U.S. diplomatic compound in Benghazi last year during the capture last weekend of a senior al Qaeda terrorist in Tripoli according to U.S. officials. Meanwhile, the Somali terrorist group al Shabaab is "gripped with fear" following the unsuccessful covert U.S. military strike against one of its leaders. The U.S. official said the locations of several attackers behind the Sept. 11 armed assault on the diplomatic compound in Benghazi and a nearby CIA facility are known. The group Ansar al Sharia, which has links to al Qaeda, has been identified as behind the attack that killed U.S. Ambassador to Libya Christopher Stevens and three other Americans. By conducting the high-profile raid that captured senior al Qaeda terrorist Abu Anas al Libi in Tripoli, the administration is likely alerting the Benghazi terrorists and possibly driving them into hiding. Asked about the lack of action against the Benghazi attackers, a senior administration official told the Free Beacon: "A lot of people are focused heavily on delivering justice to the Benghazi attackers, and no other recent action takes away from that laser focus." Al Libi, who was linked by U.S. officials to the 1998 bombing of U.S. embassies in Kenya and Tanzania, was captured Saturday during a special operations raid, Pentagon spokesman George Little said in a statement. Little disclosed in a Monday statement that the target of the Somali raid late Friday was Abdikadir Mohamed Abdikadir, known as "Ikrima," a Somali-born Kenyan. Although the raid was not successful, Little warned that the U.S. military "has unmatched capabilities and could rely on any of them to disrupt terrorist networks and plots." U.S. officials said the second commando raid was aborted after a firefight in a southern coastal town. According to U.S. officials familiar with reports from Africa, al Shabaab fighters currently are "gripped with fear" after the commando raid. The strike in Somalia was carried out by a covert commando team against a senior al Qaeda leader in the town of Baraawe. One new report stated that the militants were "gripped by fear" after the attack and the group has moved militias to the area as reinforcements. Al Shabaab fighters were observed by residents patrolling the town in large numbers, the report in the news website Akhbar on Sunday stated. Residents in the town were warned by al Shabaab fighters to stay indoors and to reduce travel at night. A second report said al Shabaab has imposed a curfew on the coastal town, located about 120 miles south of Mogadishu. The Somali website Bulshoweyn.com report that a search operation also was underway for possible collaborators with the commandos and that an undisclosed number of people had been "rounded up" and detained by al Shabaab. "Whatever the case may be, the situation in Baraawe was calmer this morning than yesterday," the website reported Monday. "Business activities have returned to normal, although the town remains tense." The Somali cable television outlet Horn Cable TV reported Sunday that al Shabaab had mobilized groups of fighters after one of the group’s fighters was reported killed in the raid. Al Shabaab’s operations commander, Sheikh Abdiasis Abu Musab, said the attack was repulsed despite the death of the fighter. The target of the attack, al Shabaab leader Ahmad Abdi Godane, was not injured, according to reports from Somalia. Alleged military supplies from the raid were put on display by the militants. Photos posted online included plastic water bottles, a military canister, assault rifle ammunition, plastic material and a flexible ladder. Additionally, fighting was reported at other locations inside the town. According to local press reports, the raid took place early Saturday and lasted less than an hour. Attackers targeted a house along the coast that was defended by guards. Mortar rounds were heard exploding followed by gunfire. The raiders were transported by helicopter. Baraawe was the location of an incident in June when two al Shabaab leaders, Ibrahim Haji Jama Miad "Ibrahim Afghani" and Moalim Burhan, were killed, reportedly by Godane, apparently as a result of a split within the group. Al Shabaab militants conducted the deadly attack on Nairobi’s Westgate Mall last month, killing 67 people. The group said on its Twitter feed that the attack was retaliation for Kenyan arms attacks against al Shabaab in neighboring Somalia. On the Somali target, Little said: "Ikrima is a top commander in the terrorist group al Shabaab, an al Qaeda affiliate." "Ikrima is closely associated with now-deceased al Qaeda operatives Harun Fazul and Saleh Nabhan, who played roles in the 1998 bombing of the United States embassy in Nairobi, Kenya and in the 2002 attacks on a hotel and airline in Mombasa, Kenya that resulted in the deaths of Kenyan and Israeli citizens, including children," he said. Commandos sought to capture Ikrima under Pentagon authority to use military force against al Qaeda and its associates, he said. "While the operation did not result in Ikrima's capture, U.S. military personnel conducted the operation with unparalleled precision and demonstrated that the United States can put direct pressure on al Shabaab leadership at any time of our choosing," Little said. News reports Monday stated that al Libi is being held aboard a Navy ship in the Mediterranean and will be transported to New York for criminal prosecution. "Wherever possible, our first priority is and always has been to apprehend terrorist suspects, and to preserve the opportunity to elicit valuable intelligence that can help us protect the American people," Little said. The capture of al Libi is the first high-profile detention of a senior al Qaeda leader under the Obama administration. The administration shut down nearly all interrogations of terrorists based on policymakers’ opposition to the harsh terrorist interrogation policies of the George W. Bush administration. Former CIA operations officer Jose Rodriguez, who has criticized the Obama administration's policy of limiting interrogations of terrorists, praised the capture of al Libi. Rodriguez said in an email that he is "pleased to see the Obama administration conducted a successful rendition operation–as several administrations before it had done." Al Libi was indicted in 2000 for his role in the 1998 bombings of U.S. embassies in Kenya and Tanzania that killed 247 people, including 12 Americans. He also has been linked by U.S. officials to other al Qaeda terror attacks. Little said no U.S. personnel were injured in the operation. "These actions are a clear sign that the United States is committed to using all the tools at our disposal to bring to justice those who commit terrorist acts against Americans," he said. Meanwhile, an information campaign against al Shabaab is continuing on the Internet. U.S. officials said the group’s seventh Twitter account has been suspended. The Twitter account sent social media messages during the deadly mall attack in Nairobi and was suspended for violating Twitter’s terms of service that prohibit support of violence. Al Qaeda’s first official Twitter account, @shomokhalislam, was shut down after five days of operation. Creation of the account, the first by the terrorist group behind the Sept. 11, 2001 attacks, was first reported by the Free Beacon Sept. 27. The Shumukh al Islam website, an official al Qaeda members-only website, also has been offline for the past several day, according to counterterrorism analysts. This entry was posted in National Security and tagged Al-Shabaab, Ansar al-Sharia, Benghazi, Christopher Stevens, Libya, Somalia. Bookmark the permalink.